Ideal for Tasty and Flavored Smoking - Hot or Cold! • Do you love the smoky flavor in your BBQ? YumYum Premium Smoker Tube is what you need. • Get the flavor of your favorite spices, herbs and condiments into your grill and BBQ. • 5 Hours of Sizzling and Billowing Smoke on any Grill. • Compatible with any grill (gas, electric or charcoal). • Lightweight and portable. Easy to carry. Take with you to outdoors, camping, friends, etc. • Made with durable stainless steel to prevent rust. • Stable in your grill, it does not roll around. It does not make any mess in your grill. The square shape provides stability. The Smoker Tube will not fall off your grill. • Easy to use and easy to clean. • Perfect to add tasty flavor to your meat, fish, cheese, bacon, sausage, hot dog, etc. 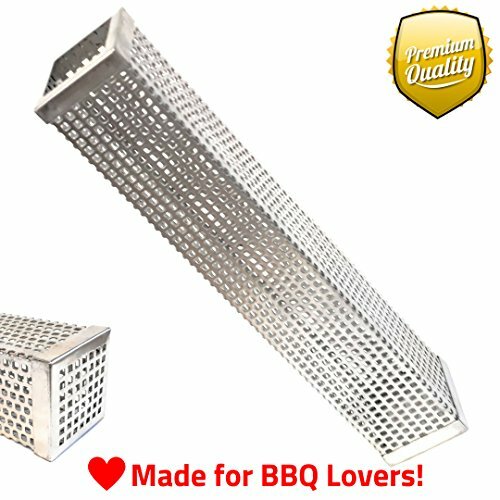 • Have a Grill and BBQ Lover in your life? This Smoker Tube is a Perfect Gift for Grill and BBQ Lovers! • Enjoy the MOST DELICIOUS SMOKED GRILL and BBQ with YumYum Smoker Tube. 1. Fill-up the Smoker Tube with your favorite flavored wood pellets, wood chips, or sawdust. Add your favorite herbs, spices, condiments, etc. 2. Light-up the top wood in the Smoker Tube with a blow torch or match. 3. Let it burn for few minutes, then blow out the fire. 4. Place the Smoker Tube in your grill and let it infuse the flavor into your food. That's it! Sit down, relax, and enjoy your food!! [5 HOURS OF SIZZLING HOT or COLD SMOKING] Perfect for Tasty and Flavored Smoking - Hot or Cold! Gives you the best tasting grill with up to 5 hours of Sizzling and Billowing Smoke. Perfect for smoking ribs, chicken, pork, fish, cheese, hot dog, lamb, corn, bacon, sausages, and many more. Perfect Gift for Grill and BBQ Lovers! [USE YOUR FAVORITE CONDIMENTS] Infuses the rich and smoky flavor from your favorite herbs, spices, condiments, etc. into your grill and BBQ. You can use it with a variety of flavors from wood pellets, wood chips, sawdust, spices, herbs, cherry flavor, hickory flavor, etc. to make the best tasting BBQ on your grill. [COMPATIBLE WITH ANY GRILL] - gas, electric or charcoal. You can get the best tasting smoked grill and BBQ with your current grill. Saves you money while giving you the best tasty food! [LIGHTWEIGHT & PORTABLE] Easy to carry. Take with you to outdoors, camping, friends, etc. Easy to use. Easy to clean. [DURABLE, NO RUST, STABLE] Made with durable stainless steel to prevent rust. Stable in your grill. It does not roll around. It does not make any mess in your grill. The square shape provides stability. It will not fall off your grill. Easy to use for balanced and flavor-rich smoking. It is safe. It is strong and durable. It will last you long. If you have any questions about this product by YumYum, contact us by completing and submitting the form below. If you are looking for a specif part number, please include it with your message.